A lovely rescue story and some cautionary advice about prey drive in pitbulls. This is our new family member, Bella. We adopted her from the Town Lake Animal Center in Austin, TX. She had either been picked up or dropped off as a very sick and underweight stray with dog bite wounds on her face. And she'd recently had puppies. No one knew anything else about her. When we adopted her she weighed just shy of 45 pounds, had terrible flea allergy dermatitis with flaky skin and hair-loss around her rump and back legs. She also had terrible diarrhea and anxiety from being cooped up in a small kennel for two months. Now she is a healthier 52 pounds and has the shiniest, softest, prettiest red brindle and white coat. She is absolutely perfect with my 3 year old son, and is nearly so with my 8 year old corgi/pug mix. She is 3, and much bigger, so naturally she has more energy than he does. She doesn't always leave him alone when he doesn't want to play. So we take her to the dog park a couple times a week in addition to daily 1-4 mile long walks and swimming at the San Marcos River. Plus she pulls our kid's stroller and plays frisbee and fetch like a dream. She has learned to sit/stay/come/lay down in the month we've had her. She lets my son crawl all over/under her while squealing and tugging her ears and tail; and she just covers him with polite little kisses. Eventually I think she would love to do some sort of sport like agility or tracking. The only problems we've had with her is her intense prey drive. It doesn't matter if if's a cat, shadow, or a cockroach, she wants it! Then every once and a while she will get into fights at the dog park, usually with other alpha females. It's easy to tell which dog she's going to go for too. Most the time it's easy to call her off and she stops. She's even gone after my neighbor's dog (husband opened door, neighbor was there with her older alpha female, Bella charged after her). There were easily 30 dogs at the dog park today and she got into it with three of them, the rest were just fine, and no one was hurt. I feel at times that maybe she thinks she's protecting us, or perhaps she needed to defend herself in the past; but she was likely trained to "Get it". Get what i don't know but she will with full force and intensity. Perhaps she was used as a hunter or a fighting dog, i don't know. training, what else can be done? Kudos and congratulations on saving a shelter dog. Bella has come a long way since she has been in your care. It sounds like she is fitting nicely into your household. High prey drive and antipathy towards other dogs are pretty common in pit bulls. And since this poses a danger to other pets, it has to be carefully managed. 2. Enroll in a group obedience/socialization class. She may already know some obedience commands. But, that's not the point. A group class will give her the opportunity to learn how to greet other dogs appropriately in a controlled environment. Look for an instructor who uses positive reinforcement and has some experience working with powerful breeds. 3. Teach her the 'stay' or 'wait' command. Given what happened with your neighbor's dog, this is the next thing I would teach her. Instead of charging out an open door, she needs to wait at the threshold until you release her. That gives you the opportunity to make sure the coast is clear before you let her out. You or your husband should be with her at all times when she is outside. 4. Keep up the exercise routine. It sounds like your family has an active lifestyle which is exactly what a dog like Bella needs to stay fit and keep her energy level manageable. 5. Consider classical counter-conditioning exercises. If Bella still needs work on her social skills after the obedience class, you may find exercises like the ones found in Click To Calm - Healing The Aggressive Dog by Emma Parsons helpful in re-conditioning her behavior around other dogs. 6. Regarding your son and Bella... Personally, I would not allow a child to pull a dog's ears or tail. Just as we expect our dogs to be gentle with our children, we should teach our children to be gentle and respectful of our pets. Be Bite Free is a free downloadable coloring book that explains why dogs--even our own dogs--sometimes bite. At 3 years of age, your son is too young to absorb the lessons on his own. But, it's something the two of you could do together if you're interested. Good luck. Feel free to post back here with other questions. Enjoy your beautiful pit bull. For suggestions on obedience training, visit our pit bull training page. As a terrier, they can have incredible prey drives. There's nothing you can do to "train" it out of her any more than you can train herding out of a border collie. What you CAN do is manage it with focus work and obedience work. Knowing that your dog has a high prey drive means that you have to be extra diligent about making sure she's always on leash or securely contained. And PLEASE - don't take her to a dog park! Terriers as a breed, along with high prey drives, are prone to dog aggression. Though it can vary in intensity you're just asking for trouble. Once she gets into a fight, even if she didn't start it she WILL finish it - and by then it's too late. 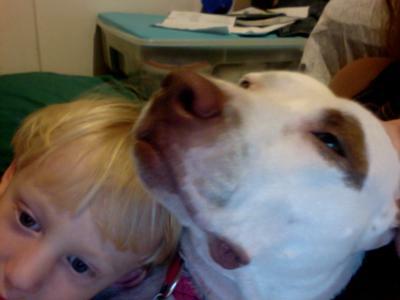 Pit bulls and other bully breeds do not need dog friends. Their favorite place to be is by their owner's side. Dog parks are also a haven for disease. You also don't have any control over the inattentive owners ignoring their dog's bad behavior. You decided to rescue a breed that is known for high prey drive and dog aggression - and no, it has nothing to do with "how you raise them"...they are terriers and as such you need to be ready for the behavior traits of the breed. If you're not then it is best that you find her another home that is able to provide the environment that is best for the dog. Just to clarify I do not Let my child pull Bella's tail/ears, he just did one day and she was fine with it. Of course I told him it was not something to do, ever. I was just making a point about her temperment. I also do not let him play with her toys or try to take them from her, or feed her/around her when she eats, etc. My two dogs eat, sleep and play separately. They tolerate each other well now with little confrontation at first, and are never left alone together or with my son without us. The main reason we went to the park was for a place she could run after a frisbee. Instead I suppose we'd just begin jogging with her, and keep up with her walks and swimming. Jen - I think you have reason to be optimistic at this point. I can assure you there are dogs who are not dog-friendly by nature who still manage to get a CGC. Bella has adjusted reasonably well to co-existing with your other dog which suggests some flexibility on her part. As Deb indicated, you won't be able to rid Bella of her dog aggression, but it can often be managed through various techniques. I would encourage you to move forward with your plans for her while staying open to the possibility that her gifts may or may not be in the areas you are currently contemplating. It's something that will unfold over time. Bella is a lucky dog to have such great owners. I'd love to know how obedience class goes.